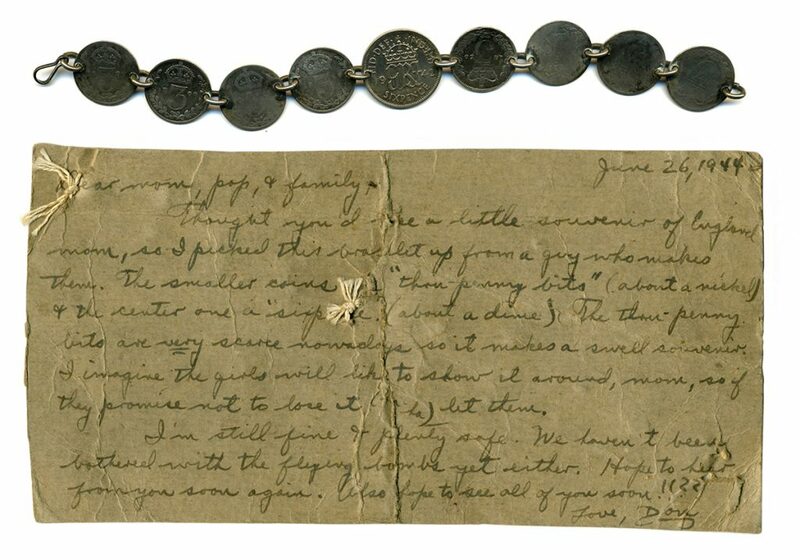 Carolyn Porter | "...a swell souvenir..."
See/read a letter and a bracelet a soldier sent to his mom, June 26, 1944. Thought you’d like a little souvenir of England mom, so I picked this bracelet up from a guy who makes them. The smaller coins [are] “three-penny bits” (about a nickel) & the center one a “sixpence” (about a dime). The three-penny bits are very scarce nowadays so it makes a swell souvenir. I imagine the girls will like to show it around, mom, so if they promise not to lose it (ha-ha) let them. I’m still fine and plenty safe. We haven’t been bothered with the flying bombs yet either. Hope to hear from you soon again. Also hope to see all of you soon!!? ?